In today’s increasingly competitive business environment, organizations must be able to adapt to the ever-changing business landscape where traditional business concepts no longer ensure success. The future will be driven by value and competing ideas—creating an environment where old alignments and equations will be replaced by a global network of projects and brand equity can evaporate quickly. Scale business relationships or perish is becoming the new mantra. Examining emerging trends and the future of outsourcing, the text provides authoritative insights into what are becoming the new ways of doing business. The authors supply the enterprise-wide vision of corporate capabilities needed to address contemporary outsourcing issues and include helpful tools for evaluating offshore vendors and determining the best location for your infrastructure needs. I have known Vivek Sharma for more than 14 years … . We joined Infosys within a span of a few months and were part of the same group for 13 years. Over this period, we have worked together on multiple outsourcing projects … . He is one of the best technology consultants and always carried great respect among customers and peers alike. His advice was an authority of sorts on the subject. … a deep study into web based and traditional outsourcing. The propounded business models and frameworks, mostly unused and unknown, are sweeping by far and justifiably patented. The future projections and trends are so far-reaching and carry relevance long term. … a work of art in writing style … many business related poetic renditions stretch the reader’s imagination in interpreting and decoding their somewhat sublime meanings. 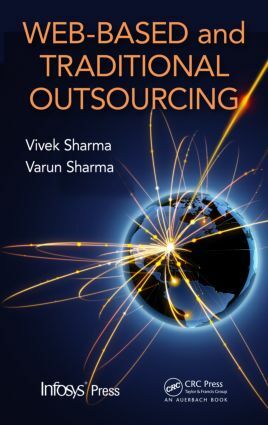 Web-Based and Traditional Outsourcing by Vivek Sharma and Varun Sharma published by Infosys and CRC Press far exceeded my expectations and is definitely a recommended read for nearly all managers, but especially those in procurement, product development, IT, and anyone working on the provider side of the sourcing industry. The reason I recommend Web-Based and Traditional Outsourcing can be summarized into four main reasons. Sharma has presented outsourcing in a very balanced approach by addressing not only the value proposition but also the issues and concerns from the outsourcing recipient’s and provider’s perspective. Authoritative examples were used extensively as case studies across a wide range of business process outsourcing (BPO) applications as well as more typical IT outsourcing arrangements with more BPO examples than IT examples. The factors affecting the outsourcing value proposition for the recipient and provider were covered equally for every outsourcing model imaginable including insourcing, partnerships, onshore outsourcing, nearshore outsourcing, and offshore outsourcing. Anyone looking to develop new business models or re-imagine existing business models will find extensive insights and specific details on how web-based outsourcing is being used to by outsourcing recipients and providers to respond to economic downturn with new products, expanded value proposition and improved business operations. At roughly 400 pages readers who are not involved in product development, procurement or IT management will still find a lot of value in picking up Web-Based and Traditional Outsourcing because the chapters are clearly organized so you can do some targeted reading. If you are already in a sourcing relationship or just considering the benefits of outsourcing, the sections on vendor selection, choosing a sourcing model, contracting, and ongoing operations including considerations for the various models, roles and responsibilities, and key success factors will be especially useful to you. Strategy—Is Outsourcing Part of the Solution or Not? Vivek Sharma is a Post graduate in Management with Bachelor’s of Engineering in Computer Science. He has 18 Years of IT consulting experience, primarily with Infosys Technologies Ltd. He has managed consulting assignments across the U.S., the U.K., and Singapore. He is the founder of "Value Adders". He has filed 2 Patents in India, U.S. jointly with co-author Varun. These are discussed as business models in the Chapter – Web Outsourcing Models, Frameworks. He has authored an International Technical paper on "Dataguard" published in 2006 in the International IUOG Journal. He has additionally authored various thought papers for in-house use at Infosys. He has anchored various Corporate & in-house Trainings at Infosys. He has received various Corporate Awards at Infosys. Varun Sharma is a Post graduate in Management with a Bachelor’s of Engineering in Computer Science. He has over 17 years of IT ITES consulting experience and is the founder of "Infinity Services".He has filed 2 patents in India, U.S. jointly with co-author Vivek. An expert in deploying cross domain knowledge, to drive down Attrition in Call Centers he has applied various innovative solutions and methods including Hypnosis, Autosuggestion/Suggestion techniques for Stress Management. He has analyzed IT/BPO share trends in the stock market using various financial tools. He has anchored various Corporate and in-house Trainings in IT/BPO processes, soft skills, and personality development and has the taken the IELTS exam to augment workshop programs.